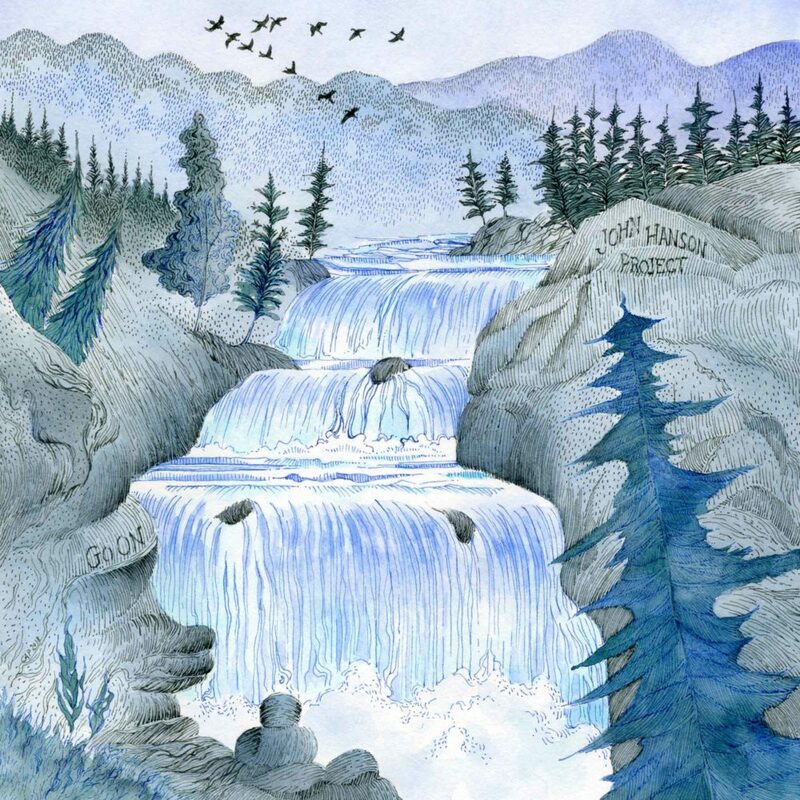 ©2018 Carolyn A Pappas, Wilderness River. Pen and ink with watercolor, 8 x 8 inches. Album art for John Hanson Project. I had so many plans for my art in 2018 but things did not work as planned. I sorely underestimated the mental and physical energy that working full time as a new nurse would require. I was working more hours than a normal 40 hour workweek with odd shifts and a very irregular sleep schedule. For the last three months of the year, I didn’t pick up a pencil or a paint brush even one time and I felt so out of sorts. I’ve since taken some steps to remedy that situation and I’m looking forward to having more time for artwork in the coming months. I have no formal goals for this year, but I just want to have fun and concentrate on making art daily or as close to daily as possible. I also want to focus on sending out my newsletter every month–I neglected to send that out for the last few months of the year and I regretted it. My January edition will be going out within the next few days (click here to sign up). I’m looking forward to what 2019 will hold for me and I hope that everyone reading this has a prosperous and fulfilling year ahead. Above is an illustration I completed for the cover art for the self-released album by John Hanson Project. I’ve known John for several years and he is an extremely dedicated musician who has been working tirelessly for years to realize his musical dreams. I highly recommend that you check out his new album Go On. I’m getting back into the swing of art after taking a much needed break. I’ve recently started reviving from a serious artistic funk in which I haven’t had the inclination or desire to engage in any sort of art at all. I didn’t even want to look at other people’s art, check Instagram, look for “inspiration” online, or anything similar. I’ve never really experienced anything like this in the past. I wasn’t feeling depressed or anything of the sort, but I do think that I shifted focus to other areas of my life that were more immediately pressing (finances, etc.). I considered pushing on and continuing to work despite feeling very averse to the idea. The advice of many established artists is to “show up and do the work” and so forth. Instead, I truly felt like I just needed to rest my brain and to do nothing. Now that things have quieted down a bit, I am focusing more on my art again. This time though, I am interested in expanding beyond floral art (not eliminating it entirely, of course). Throughout school and in the months following, I was drawn to florals because they made me happy and it was a subject matter that felt comfortable and easy to me. Now, I’m wanting to branch out and tackle some other subjects (other aspects of botany, rocks, and landscapes). I’m also working on some sewing projects and I’m imagining how I can incorporate sewing and embroidery into my art. 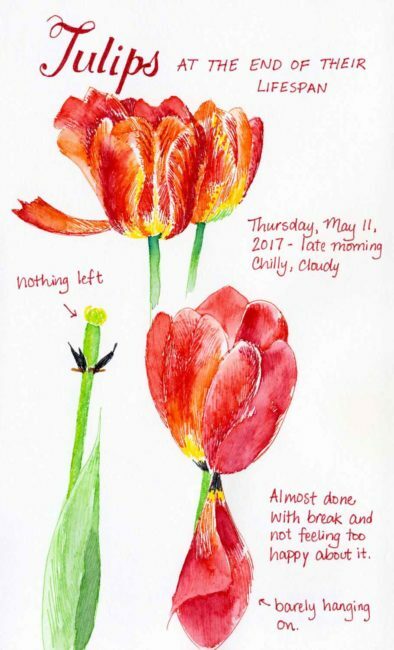 Cathy Johnson recently discussed her recent “dry spell.” I always like to read about how other artists deal with their creative ebbs and flows and it also makes me feel a little less uncomfortable with the whole process. The following images are some of the pieces I painted in the last several months. Stay tuned for some new work in my next update. 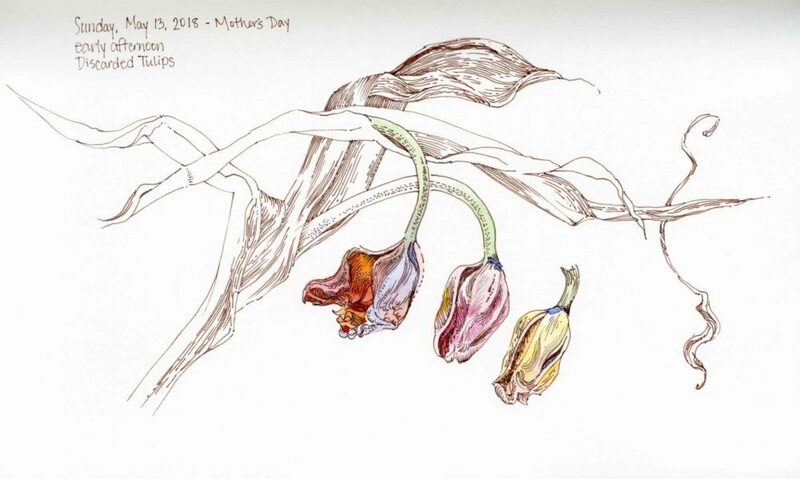 ©2018 Carolyn A Pappas, Discarded Tulips Sketch (5/13/2018). Pen and ink and watercolor in large moleskine. 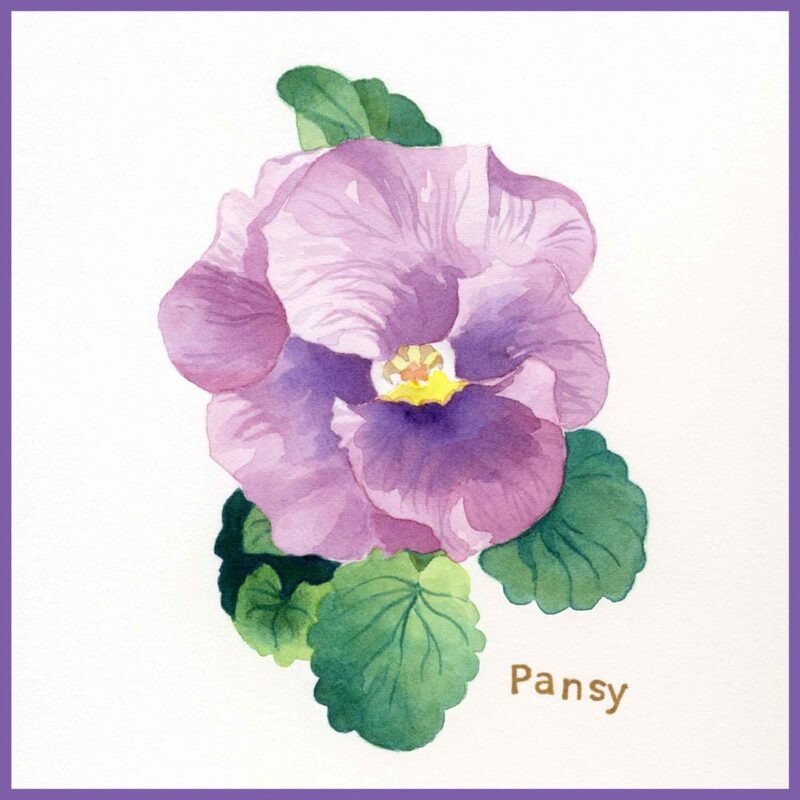 ©2018 Carolyn A Pappas, Pansy. Watercolor and rubberstamping, 5 x 5 inches. ©2018 Carolyn A Pappas, Greenery (5/21/2018). Ink and watercolor in large moleskine. 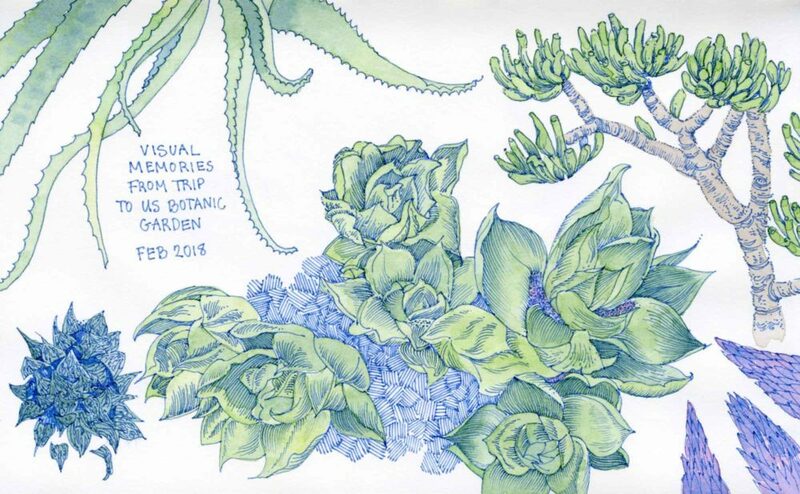 ©2018 Carolyn A Pappas, US Botanic Garden (Feb 2018). Ink and watercolor in large moleskine. Although I have taken some memorable trips in the past, I am more of a homebody and prefer the comfort of my familiar environment. I do love to read travelogues and travel vicariously through other people’s photos though. 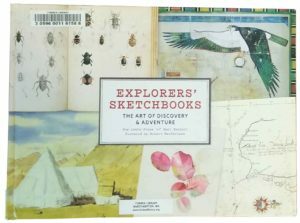 I recently found the book Explorers’ Sketchbooks: The Art of Discovery & Adventure by husband and wife Huw Lewis-Jones and Kari Hebert. It is a thick book (320 pages) and features photos of artists and sketchbook spreads from 70 different explorers’ sketchbooks, logs, and nature journals. I haven’t had a chance to read all of the profiles yet, but I’ve been enjoying myself by reading one or two essays at a time in spare moments. I really like how there is a mix or photographs showing the book in its entirety (tattered pages, crumbling spine, etc.) 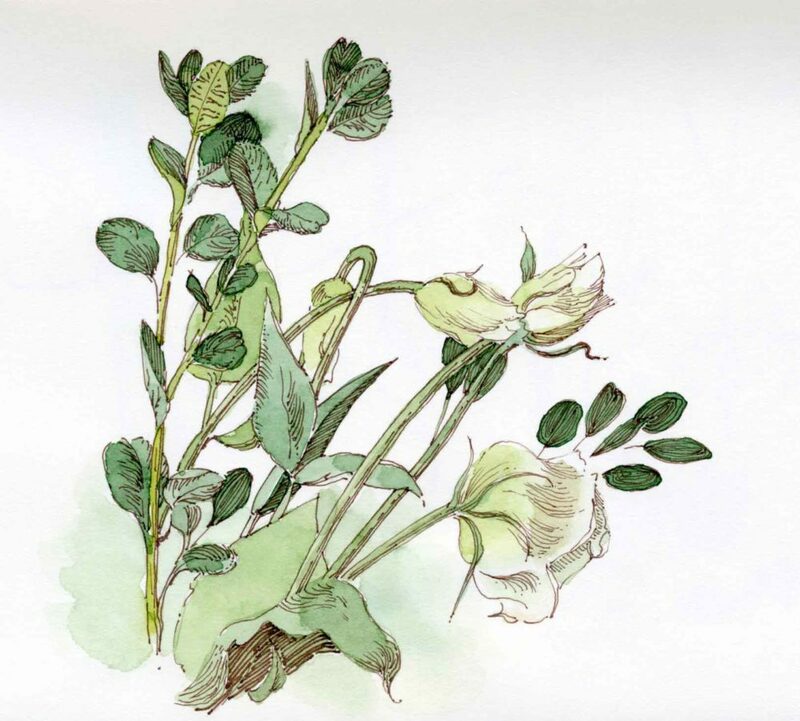 as well as details of individual drawings and photos/drawings of the artists themselves. Another thing I appreciate is that the featured sketchbooks are from modern day explorers as well as those from the more distant past. 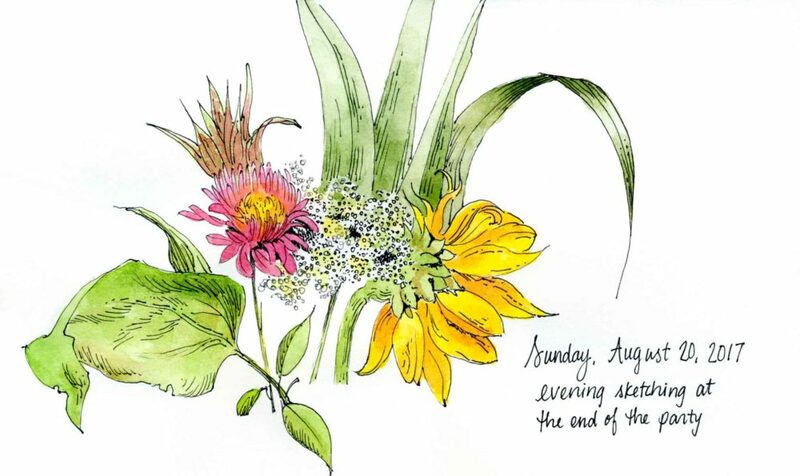 Although many of the sketchbook pages shown are beautifully illustrated, there are also some utilitarian pages included with lists of figures, diagrams and penciled in comments. I think my favorite sketchbook so far is from Edward Norton. 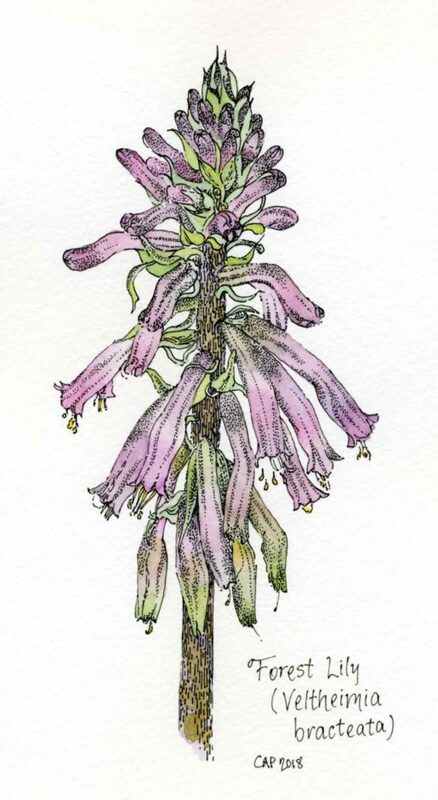 He had some majestic mountain landscapes featured, as well as closeup studies of plants. His quote below reminds me of something that a modern day plein air sketcher would say. Clearly this book was on my mind when I came across some of my late great uncle’s photographs while organizing through my reference photos on the computer recently. 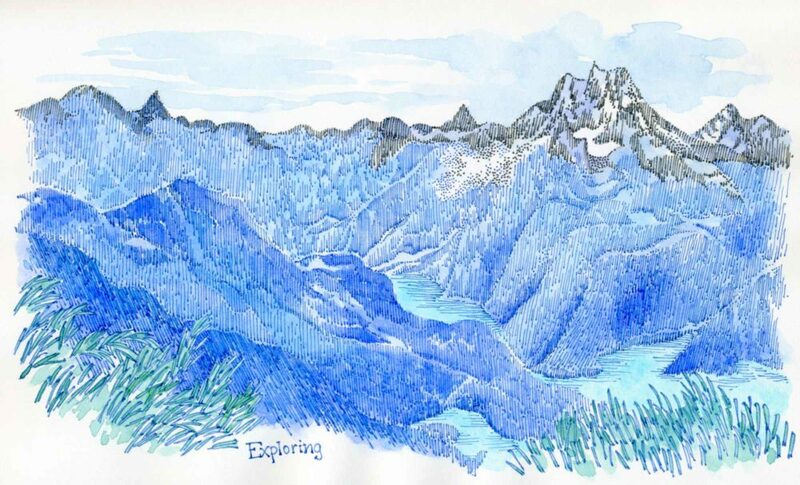 I couldn’t resist making an ink and watercolor interpretation of this mountain scene as if I were on location. Unfortunately, my uncle didn’t label or organize any of his photos so it is a mystery as to where he was when he took the photo. If you can recognize this scene, or can suggest any similar books featuring the inside of sketchbooks, please leave me a comment below. ©2018 Carolyn A Pappas, Exploring (4/6/2018). Noodler’s Luxury Blue and Lexington Gray ink and watercolor wash in large moleskine. I recently came back from a trip to Washington, DC where I got to visit a Blick store. While I was there, I got some new pens, including the Pentel Arts Hybrid Technica Pen. This is a gel pen with a metal tip and acid-free, archival, water and fade resistant ink. It comes in five sizes, from 0.3 mm to 0.8 mm. I got the 0.3 mm size to try out because I usually go for the finest lines. 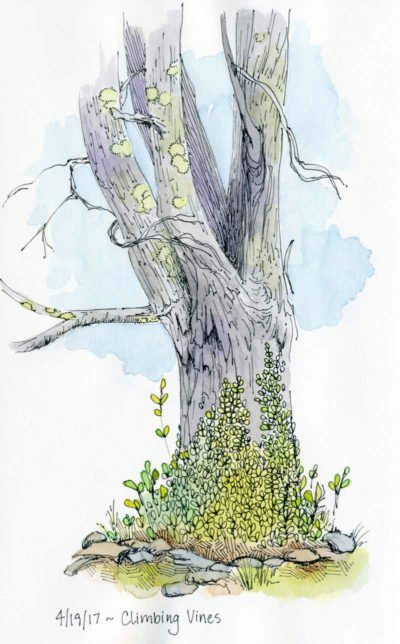 Below is a nature study I did in my Moleskine watercolor sketchbook using this pen. ©2018 Carolyn A Pappas, Forest Lily. Ink and watercolor in watercolor moleskine. It is smooth, even on coldpress watercolor paper. I didn’t notice any skipping, ink globs, or smearing. Reviewers on the Blick website noted some issues with globbing with the larger sizes. The ink is very black and the side of the pen is clear so you can easily see how much ink is left. Unlike felt tip fineliners where the nib tends to relax and get larger over time, the Pentel Arts Hybrid Technica has a tungsten carbide roller ball for a consistent line. I wish the ink were waterproof and not just water resistant. When I used watercolor over my drawing, the bleeding was minimal, but somewhat unpredictable as some areas bled more than others. I wish this pen came in other colors besides just black. I would especially like a brown or sepia colored ink. I wish refills were available instead of the whole pen being disposable. Overall, this is a great pen and perfect for throwing into my purse when I don’t want to have to worry about making sure my fountain pen is freshly inked up. I’m thinking of buying a few more in the 0.3 mm size as well as trying out some of the larger sizes. 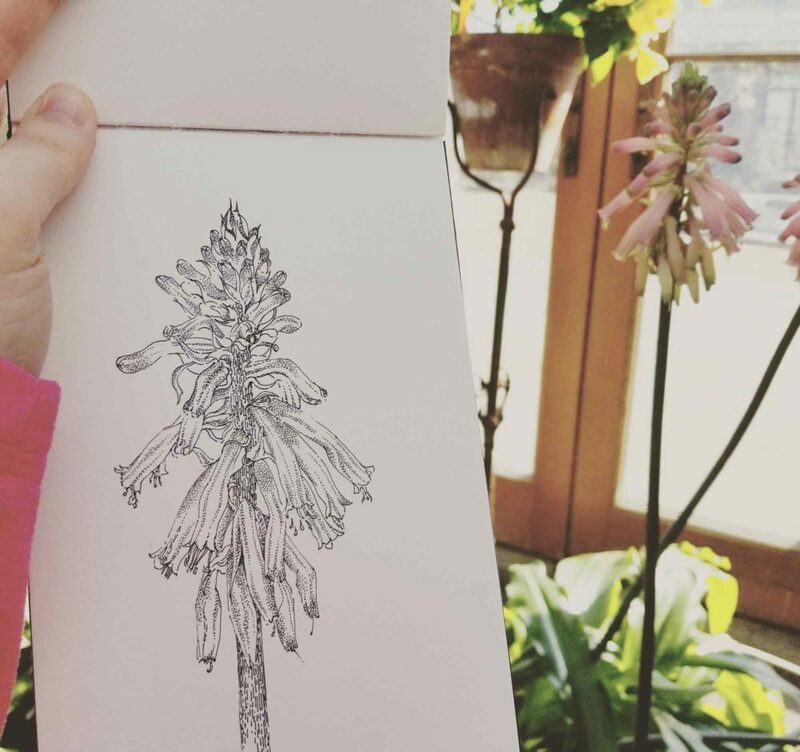 ©2018 Carolyn A Pappas, Forest Lily in Progress. Ink in watercolor moleskine. I’ve been doing a lot of drawing, painting, thinking, and planning lately (as well as studying). 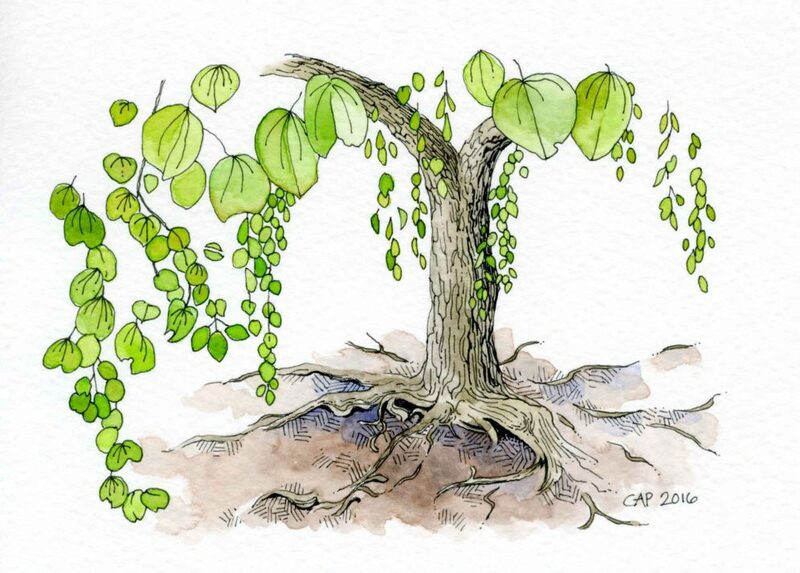 My mind has been drifting to trees lately: the trunks, branches, and leaves that appear in my sketchbooks, but also the deep roots below. Scientists have found that there is much more going on underground than originally thought (Read: Trees communicate via their own fungi-based “internet”). ©2017 Carolyn A Pappas, Climbing Vines (4/19/2017). Ink and watercolor in large moleskine. When I think of trees, I think of wisdom, strength, and stability. I’ve never had successful New Year’s resolutions in the past, but this year (probably because I am starting a new season after graduation) I really feel like I am starting my life over with a fresh start. I have been thinking of my priorities, and the things I really want to get done. I’ve also been focusing on my health, taking control of stress, and finding ways to incorporate minimalism into my life (Read: Go Deeper, Not Wider). I’ve been enjoying spending time in my sketchbooks more than ever. Instead of being a task to check off my list, artmaking has become much more of a pleasure than it has been in a long time. I know that this feeling will not last forever, but I’m really loving it for the time being! ©2018 Carolyn A Pappas, Winter Debris. Ink and watercolor on a blank note card, 12.4 x 8.9 cm. ©2018 Carolyn A Pappas, Tree Branches (1/15/2018). Platinum Carbon Ink and watercolor in large watercolor moleskine. 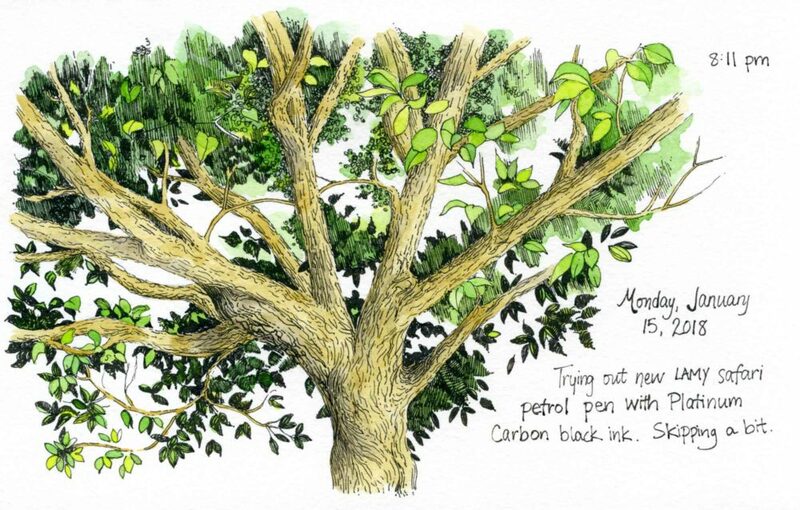 For more tree goodness, check out Terri Windling’s blog posts on trees. She writes so poetically, and the photos of her forest are so magical. Be sure to hover over each photo for poetry and quotes. ©2017 Carolyn A Pappas, Exuberant Joy (1/28/2017). Stabilo Point 88 pens, watercolor and rubber stamps in large moleskine. ©2017 Carolyn A Pappas, Tulips (5/11/2017). Stabilo Point 88 pens and watercolor in large moleskine. 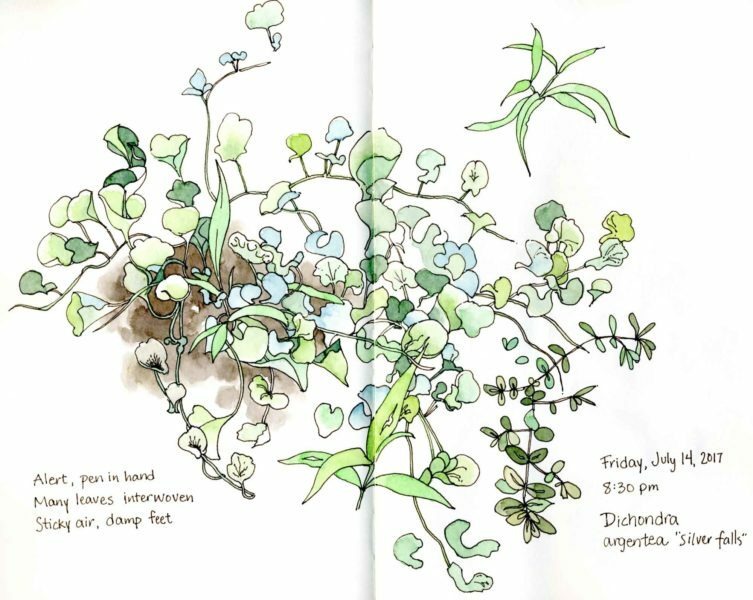 ©2017 Carolyn A Pappas, Dichondra argentea (7/14/2017). Ink and watercolor in large moleskine. This is my last post of the year where I’ll review 2017 and look ahead to my art goals for next year. This is also the conclusion of my round up of unposted artwork from the past year. The above images were sketchbook pages in my large moleskine done from life. Even though my time was limited, I worked quite a bit from life over the course of 2017, which I am proud of and want to continue into the next year. My goals for 2017 were to finish my nursing program and to incorporate more art into my life than I did in my first semester. I was successful with both of these goals, although my art activity fluctuated with my school schedule and I often went long stretches with no art making at all. My most productive times were in August and the end of April to mid-May, which coincided with my semester breaks. The least productive times were in September and November, which were also some of the busiest times of my entire nursing program. I posted to my blog 23 times this year, although 4 posts were written and pre-published the year before. For 2018, I would like to work on making art on a more consistent schedule. I have some longer term projects/series that I am planning, but I need to create a lot of new work on a consistent basis to make my plans a reality. I also want to work more from life when possible. I did a lot of small nature studies this past year and I would like to continue on that theme. I also let my email newsletter fall by the wayside while I was in school and I want to start sending that out again. I’m looking forward to an exciting year ahead. I hope everyone reading this joins me in having a productive, prosperous, and fulfilling 2018! 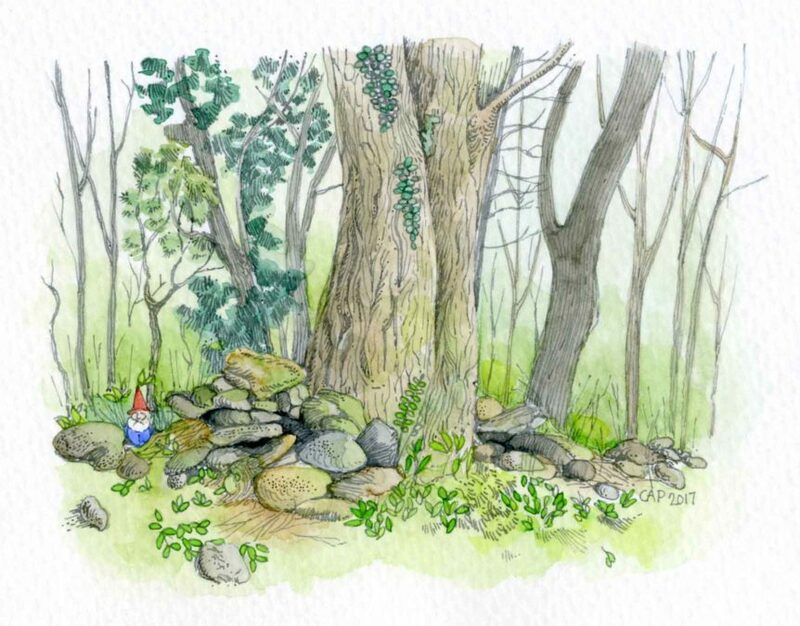 ©2017 Carolyn A Pappas, Gnome in the Woods. Ink and watercolor, 4.5 x 5.75 inches. This is a small pen and ink and watercolor that I did last winter while I was on semester break, halfway through my nursing program. It was drawn partly from life and partly from my imagination (obviously!). Two weeks ago, I finally graduated from school and I am looking forward to huge changes for 2018. I am feeling relieved, excited, and a little scared all at the same time. In terms of my artwork, finishing school will mean that I will have more time to paint, draw, and do other creative projects. I hope everyone had a relaxing festive season. I love this time between Christmas and New Year’s—it is when I review my past year and strategize for the upcoming one. Over the next few days, I will be posting all the remaining work from this year that I haven’t posted yet, along with a review of 2017 and some of my art goals for 2018. 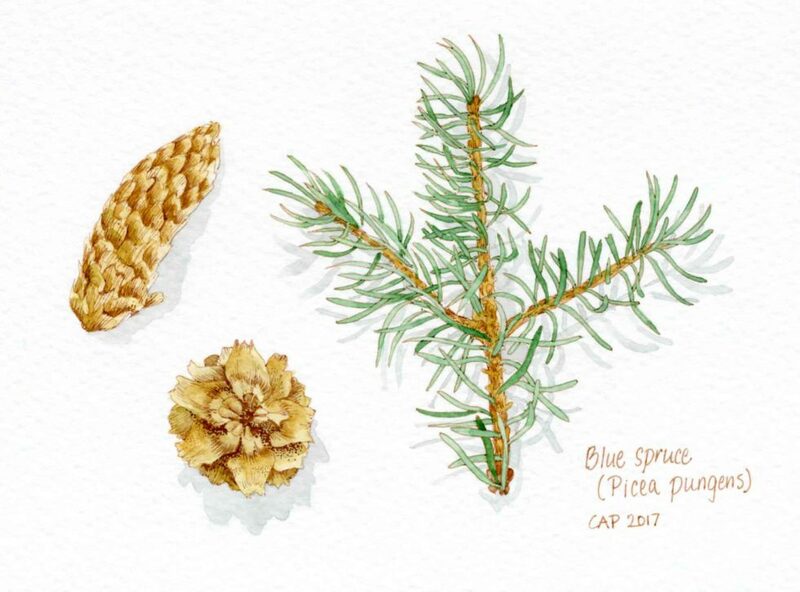 ©2017 Carolyn A Pappas, Blue Spruce (Picea pungens). Sepia ink and watercolor on 5 x 7 watercolor greeting card. 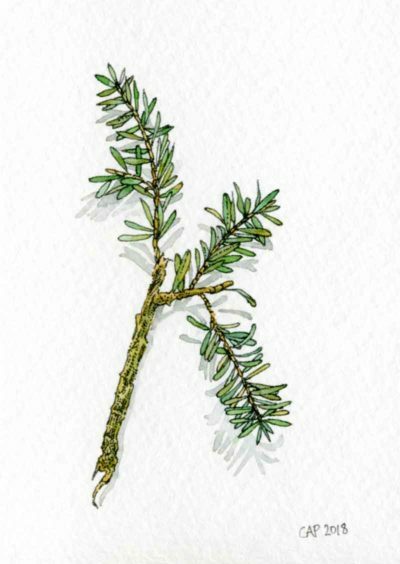 I found this little sprig and a couple of pine cones last March when I was taking a walk with my daughter. I painted in the shadows this time, which added a different element. School will be wrapping up soon and I’m going to be glad to have a break. I’m already making a list of art plans for 2018—I’ll have a lot more time for artwork and I’m getting excited. During the winter, I’m planning to do more nature studies like this so I can work indoors from life. My three week summer vacation went by way too fast and now I am back to school and pushing through my last semester. Although I did a lot of drawing on my vacation, I have gotten out of practice and don’t have a lot of work to show for it. I did find some artwork from 2016 that I never posted before. Here they are and thanks for visiting. 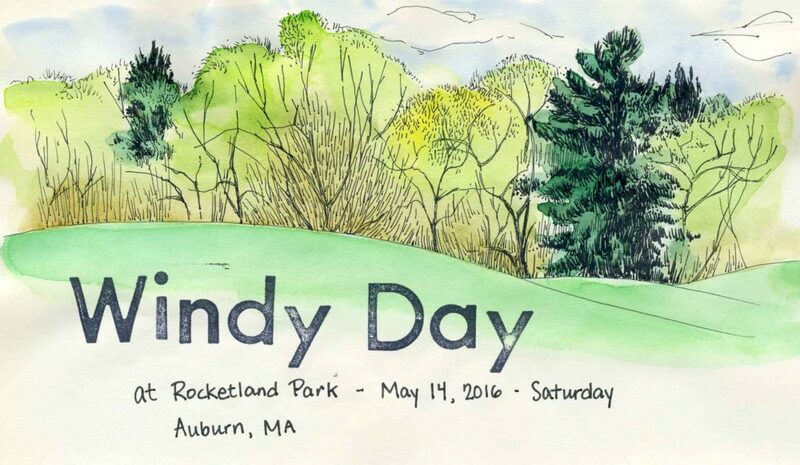 ©2016 Carolyn A Pappas, Windy Day (5/14/2016). Pen, watercolor and rubber stamping in large moleskine. ©2016 Carolyn A Pappas, Under the Weeping Katsuratree. 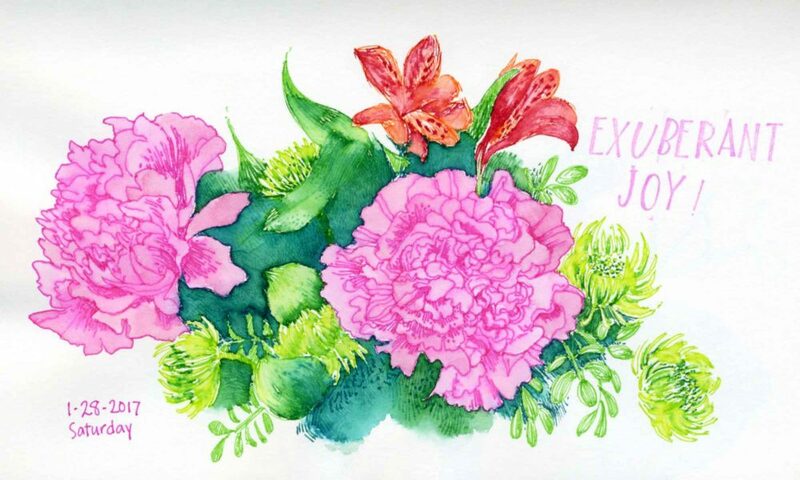 Pen and ink and watercolor wash on 5 x 7 inch greeting card. 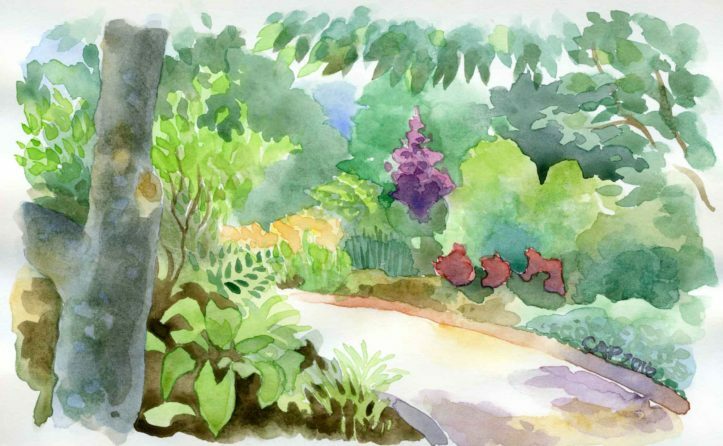 ©2016 Carolyn A Pappas, Watercolor Garden Sketch (December 2016). Watercolor in large moleskine. ©2017 Carolyn A Pappas, Medley of Flowers at the Party (8/20/2017). Ink and watercolor in large moleskine. ©2017 Carolyn A Pappas, Evening Sketching at the End of the Party (8/20/2017). Ink and watercolor in large moleskine. I had a chance to travel to Pennsylvania for my childhood friend Gwenn’s engagement party (watch a cute video of her engagement story here). I haven’t been to visit for 10 years, so it was really nice to see a lot of people and places that I remember. 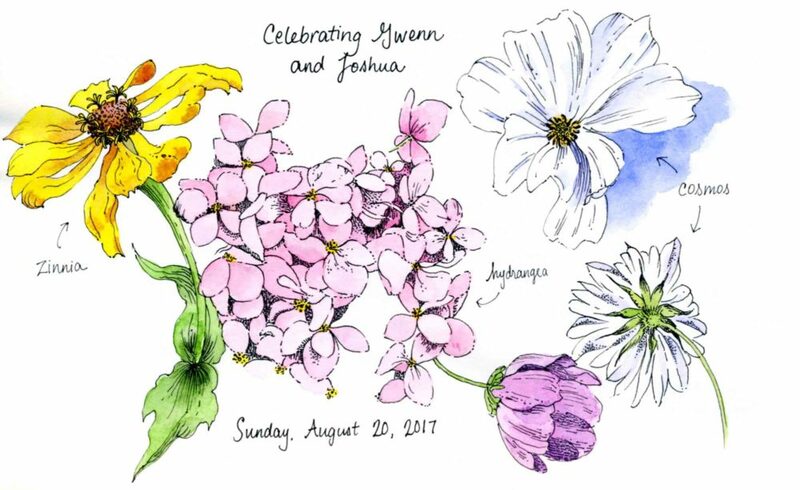 I sketched a selection of flowers from the arrangements at the party in ink and added watercolor at home. I read Austin Kleon’s Steal Like an Artist on the drive down to Pennsylvania and the followup Show Your Work! on the drive back to Massachusetts. I highly recommend both as they were quick, yet power-packed reads. There was more information in Steal Like an Artist that was new to me. I found myself using the highlight feature on my Kindle often as I was reading. Since I have gotten back home, various concepts from these books have often come to mind.